Sugar Cane Growers Council chief executive officer Sundresh Chetty with Solove Cane Farmers Co-operatives members during the commissioning of the new harvester in Seaqaqa on June 27, 2018. Sugar Cane Growers Council chief executive officer Sundresh Chetty has reminded farmers in Seaqaqa, Vanua Levu to work together in unity. During the commissioning of a $350,000 harvester at Solove on June 27, Mr Chetty urged farmers to make every effort to harvest and increase delivery of cane to the mill quickly. “The weather is very favourable in Vanua Levu and harvesting gangs in Labasa should be happy and make the most use of it,” Mr Chetty said. “I am told that about 50 per cent of harvesting gangs and about 12 to 13 mechanical harvesters are on operation in greater Labasa area. 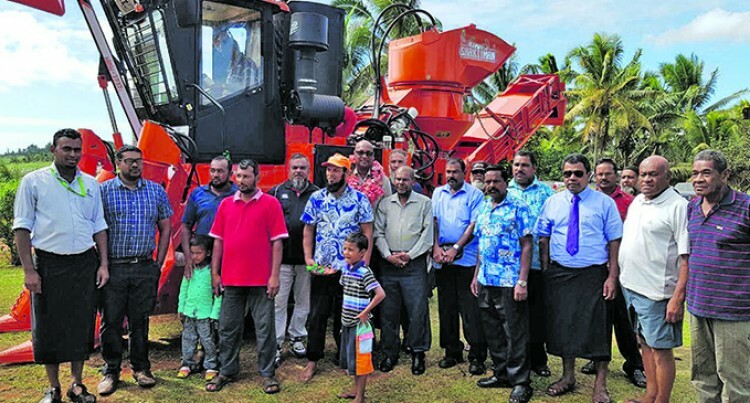 Meanwhile, Solove Cane Farmers Cooperatives president Mohammed Shameem said the harvester was bought collectively by the members from three sectors Solove, Bulivou and Natua in Seaqaqa. “There are altogether about 42 farmers in Seaqaqa and expected to harvest 10,000 tonnes of cane this year,” Mr Shameem said. “We have already begun harvesting cane. “Gone are the days where we have to hire labourers to work in the farm. The co-operative was formed last November. Mr Chetty thanked the cooperative for taking own initiative and advised them to work together as a team.